I am really looking for a turnkey trouble free SSB to use as a base unit and was considering an Uniden BEARCAT 980 for about $115. I prefer knobs to menu driven functions so my first choice was an Galaxy DX-949. I made a best offer of $145 on Ebay and was declined. Guess I am still in the market for something turn key. about the Lafayette-- after some more reading about it, it truly may be a boat anchor in true meaning of the phrase but I will follow through with I have already ordered SAMS cb radio series #6 which covers the HB-222. Is that common IF freq on the early tube cb's? What is the reason this radio was a dog and what can be done to mitigate the bad behavior? This is a 10 tube receiver and no tubes are wasted on rectifying the AC that was one of the selling points. "10 Tubes plus 3 silicon power rectifiers for 17 tube performance"
The 1650 kc IF is one that I've seen elsewhere in radio, not so sure about CB's. The 262 kc IF is an oddball for sure... I think, at that point in time (September, 1964 for Sams #6), the concept of a 23 channel crystal synthesized rig was still in its infancy, and not a matured product: People were trying to find out what worked, and what didn't. Possibly, the issue had to do with the 2nd IF (262 kc): Maybe the selection of that frequency allowed serious birdies with channels +/- 262 kc away from the channel being received. I've looked at the schematic, the rig uses 25 MHz xtals, plus the 1650 kc first IF, and the 262 kc second IF... There are also three xtals at 1650, 1750, and 1850 kc that mix with the 25 MHz crystals to get you a CB band output... Could be something in all of this mixing that just didn't work right. I know that even with better engineered radios later on, that if they aren't tuned with a spectrum analyzer on them, you run the risk of putting out significant amounts of RF crap at the crystal and mixing frequencies. With all of this old stuff, you want to clean controls (pots) and switches, plus test the tubes. I'd also replace any paper foil caps, and slowly run up the voltage on the unit with a Variac to reform the electrolytic filter caps. It looks like the advertising shows a second IF of 282 but I wonder if that is actually 262 Khz.? You will find out when you get the SAMS photofact info. 262 Khz. was a commonly used IF frequency for early car radios. Early automotive radios were built for a little better performance than typical low cost home radios and often had a RF stage for better sensitivity and used this lower IF frequency to provide better selectivity than the typical AM broadcast receiver. Several ham gear manufacturers including Gonset, Morrow, and Pierson used a second IF in the mid 200 Khz. range for their mobile receivers and this results in a still simple IF design that provides adequate selectivity for the intended use without using a crystal or other filter. A first IF in the 1650 khz. range was used by a large number of manufacturers and was one of the "standard" IF frequencies. The 1650 Khz. first IF coupled with a 282 (or 262) Khz. second IF should provide the HB-222 with good image rejection and a suitable selectivity characteristic for AM CB operation. I wouldn't worry too much about the opinion of only 1 or 2 guys on the web saying it was a dog of a radio. 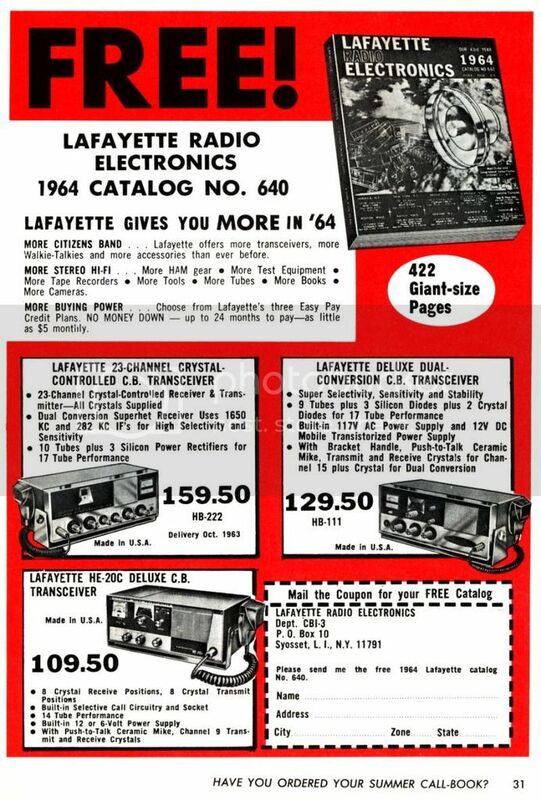 I owned lots of Lafayette tube CB radios over the decades and I wouldn't describe any of them as lousy. Exactly! Get it, put it into service, and see how performs... Some radios have better selectivity than others, but all of the ones I have seen and worked with perform adequately. I am still in the market for a bulletproof CB for the house which any of the family can use to communicate with our vehicles. We have several dead spots for cell service around where I live and a backup form of comm will be handy. I have a few old mobile units none of them SSB only one I know that works well is about a 1997 Cobra 25 sound tracker. To prove I have a sense of humor I will tell you that the Cobra is mounted in the Dash (where the CD player should be) of my 1998 Ford Cobra along with a 1/4 wave whip antenna on the back. Originally plan is cleaning up an Royce base SSB to use at home. Next step pn that radio is replace the third final IF IC. I have a thread on that radio. Part for the Royce should be here in a few days. I dont think the Royce is going to be a slam dunk though either as the adjustment procedure couldn't bring in the frequencies called for in the alignment unless I fudge the clarifier control to about 2::30 as opposed to 12:00I expect more than 1 or 2 issues with this radio. Thanks Rodger and Tom for the mini lesson on IF frequency history and performance. The HB-222 was Lafayette's first 23 channel CB transceiver. Since I was there when it was introduced in October 1963 (for the 1964 Main Catalog), the fact was it had some severe design problems in the crystal mixing scheme and alignment for both the transmitter and receiver. It was not uncommon for the HB-222 to transmit perfectly on some channel, and then after some short period of time, when the transmitter was keyed, transmit on some frequency completely different. Receiving was also somewhat erratic with strange non-CB signals popping up on various channels. Almost very transceiver was returned with the same issue. By roughly January/February 64, any units in stock were returned to the main warehouse in Syosset, NY never to be seen again. Lafayette quickly made a deal with Hammarlund to re-brand the Hammarlund CB-23 to Lafayette HB-266. The HB-266 was then used as a replacement for anyone wanting to buy a HB-222. When the 1965 Main Catalog was introduced in the Fall of !964, the HB-222 was gone for good. 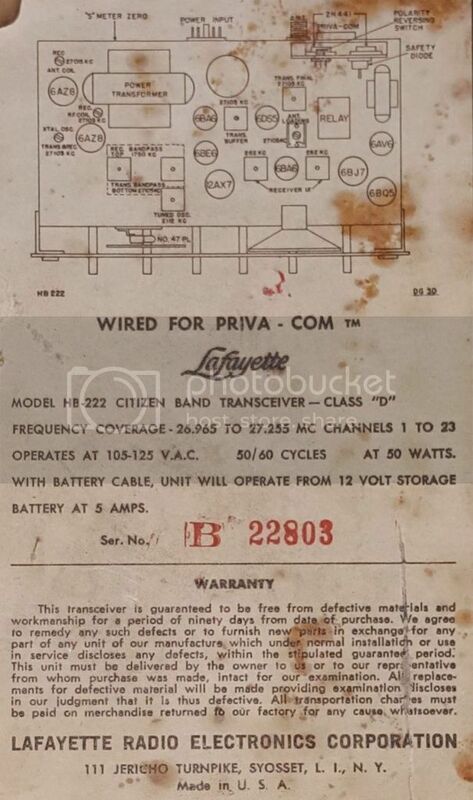 The Lafayette HB-333, 23 channel transceiver made by Polycomm, had center stage, and there also was the introduction of the first imported Lafayette 23 channel transceiver, HB-400. Maybe the HB-222, after 50 plus years, killed off all its bad stuff, and now works better. The 50 year time span may have killed off any virus or spamware that was lurking inside the HB-222 but in reality It is probably in worse shape than in 1964. I believe you that is is a dog and its highest use is as a radio toy and museum piece. I will have some fun with it for a while. And By the way manualman it sounds as if you remember these early lafayette radios and I wonder about the microphone plug. My radio comes without microphone and from the picture it appears to take a 5 pin mike. Not the typical DIN style 5 pins but 4 pins grouped together in the circumference and then the 5th pin opposite the 4. I can replace the receptacle to a more common one but would rather find the correct plug. 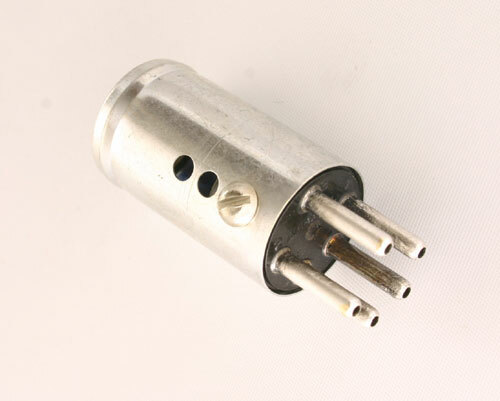 Mike plug is Amphenol 91MPM5L. Haven't been made in years but stock still floats around. Yes, pins 1-4 are only used. Pin outs in the Sam's manual. The HB-222 sounds like it has some of the same issues as the "crystalplex" Clegg FM-27B which used a crystal mixing scheme to produce its 2 meter output channels instead of a synthesizer. It generally does produce a reliably high power signal on the desired frequency but the results of its mixing scheme also produce quite a few undesired spurs also. The output viewed on a spectrum analyzer is best described as interesting. Fortunately B&W did a much better job with their 6100 HF SSB transmitter which uses 20 crystals in the "VFO" and another 5 in the hetrodyne oscillator. It produces a very stable and pretty clean output but it definitely isn't compact. Careful alignment might result in a somewhat usable HB-222 but it sounds like it is either a candidate as a shelf queen or as a subject for major modification using a DDS synthesizer to replace the current injection scheme. The latter isn't practical because it is putting a significant amount of money to cobble something together whose function could easily be duplicated by a better rig but it could provide an interesting experiment for someone who wants to make what was probably once a fairly expensive piece of gear actually usable. Ahhh! Thanks for bringing up the name of Clegg! I was never unfortunate enough to own an FM-27B, but the FM-28 is an old favorite of mine! I've got a couple of them, but they seem to have issues with contact resistance due to age, which causes them to stop working. I'm currently working my way through a bunch of 23 channel tube type CB's... They are fun to play with. The FM-28 wasn't actually a Clegg design or manufacture. The unit was made by Uniden and was also sold under the Uniden name/model and also as the Midland Model 13-510. I bought a HB-222 in the late 60's and I had the same problems described earlier. It would not stay on frequency. It was Lafayette's first 23 channel radio and I suspect it was made by Hammarlund. It is almost an exact copy of the CB-23 except the 222 uses a 6BQ5 for the output modulator and the CB-23 used a 6GW8. The chassis was bigger on the HB-222 compared to the CB-23 and the later replaced HB-266. Both radios have the "bead chain" drive to move the 3 step channel change over. I still have my Sams CB-6 I bought for that radio. It is ironic that Lafayette replaced it with the HB-333 which was no frills Polycomm SR. 23 which was actually the first 23 channel synthesized radio. The Hammalund CB-23 was the second synthesized CB radio that was introduced. I also have two HB-333's which IMHO have a much better receiver than the HB-222 and it was the first Lafayette that had "Range Boost". The HB-222 was not made by Hammarlund. There were three USA manufacturers (at different times) that made Lafayette's early CB and amateur radio line. How the mechanical similarity between the HB-222 and the CB-23/HB-266 came to be was kept a secret. The Hammarlund CB-23 was actually introduced in 1962 almost a year prior to the introduction of the HB-222. The HB-333 was already in the works when the HB-222 was introduced. I still have (for some reason) the production line test spec validation for various HB-333's in the production cycle before shipment. HB-333 only lasted roughly a year. By then the imported CB line had taken root and the majority of the CB's introduced over the following years were all imported.